System call hijacking is an interesting low-level way for the hacker / penetration tester to gain system privileges of a system, and deploying rootkits for faster and intrusive-less privilege mitigation. Today, let’s take a look at how exactly this works by breaking down the anatomy of a system call, and performing an actual hijacking. 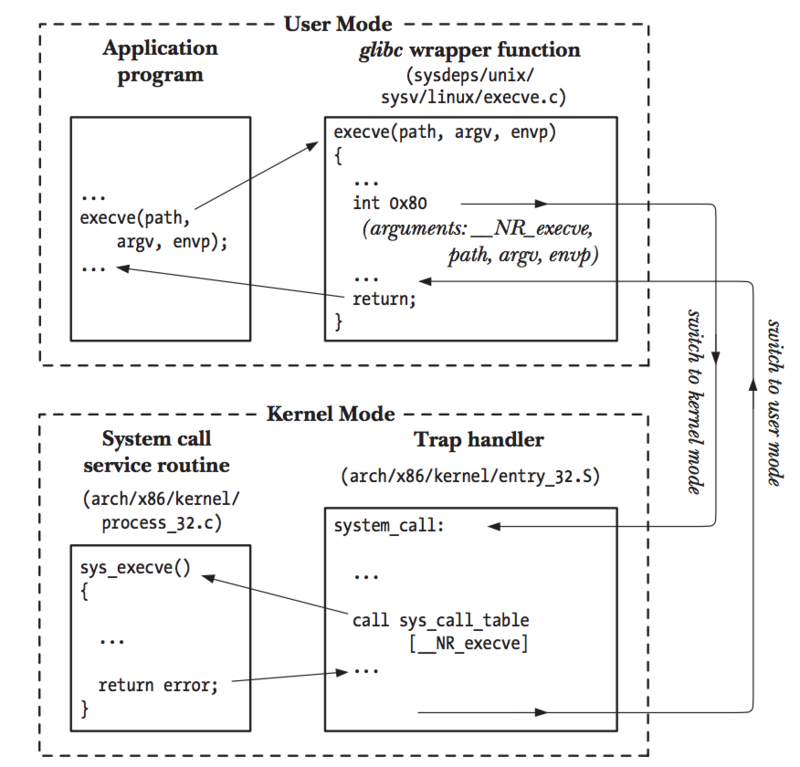 This image is from the Linux Programming Interface, and it provides an incredibly detailed look at exactly what occurs when a user calls a wrapper function at the user-mode, and how the service routine is handled at the kernel-mode. write(2, "Try 'printf --help' for more inf"..., 42Try 'printf --help' for more information. That’s quite a bit of work for such a simple operation. Let’s break it down based on what we know. The first call made is a execve(2), which signals the creation of a replacement process to the current one. Notice how in the strace call above, the program name, parameters and an environment string. int 0x80 is made within execve, which is a kernel interrupt that actually switches the context to kernel mode and ensures that the proper arguments specified are passed. int 0x80 is actually utilized within x86 Assembly in order to make a system call at the kernel-space once required parameters values are all placed in the respective 32-bit registers. The service routine that is executed and performs what it is tasked to done. However, in the very end, a return value is passed back to signify status such as success / failure (0 / 1). Register values are restored for later use, and the return value is passed back to user-mode. Wow, that’s quite a deep trip down the rabbit hole. Knowing this knowledge, we can now actually try to write our own loadable kernel module, or LKM in order to modify the execution of a system call. LKMs are low-level code that is implemented at a kernel-level in order to provide support for new hardware or extend the release of a the kernel, but we will be doing this to do some more…malicious stuff. Let’s write a LKM that modifies and hijacks the open() call. Note that at the time of writing, I’m am currently using a 4.16.13-2 Linux kernel version, and that standards for writing kernel modules may change in future updates. Another variable we need to make global is the pointer to the actual open() system call. This can be done by actually accessing the sys_call_table with the __NR_open constant, which defines the system call number. We are going to be using the asmlinkage tag, as we are at a kernel-level, and all of our arguments are not placed into registers like ebx or ecx, but rather the CPU’s stack. As referenced in several posts about hijacking system calls, we need to make changes to whats actually going on in the system call table. This can be done by flipping some bytes so that we are able to write to this memory page, as it is normally write-protected. We also make a function that sets it BACK to read-only mode, such that it will appear nothing has been changed. Alright, with that done, let’s actually hack open()! As per the comments, the body of the function is where we can define whatever we want to do. However, at the end of that, we call return BACK to the old open, passing the arguments with it to complete its execution. This is where the actual hijacking takes place, and it is really up to the dev / pentester to determine what to actually write when manipulating the passed arguments. The function above simply prints out the arguments passed, but there can be so much more that can be done. The comments explain everything, but what essentially occurs with init_module is that we set the memory page to write, grab the syscall number of open and store it within old_open for future use, and set the syscall number to point to our new open routine. When cleanup_module is executed, it reverts what was done, and sets the system call table back to read-only. example.c is just a test file that utilizes open to see if the kernel module works. The source is within the repo, so feel free to look at the example. We are done! If you do write an example, you can check to see the output of the kernel module with dmesg. System call hijacking is a quite interesting approach, and really provides the foundation for leading into stuff like developing rootkits. These are especially interesting exploitation techniques to learn, but also general stuff about the Linux system and kernel itself. © 2019 Alan Cao Built with Jekyll and The Plain theme.